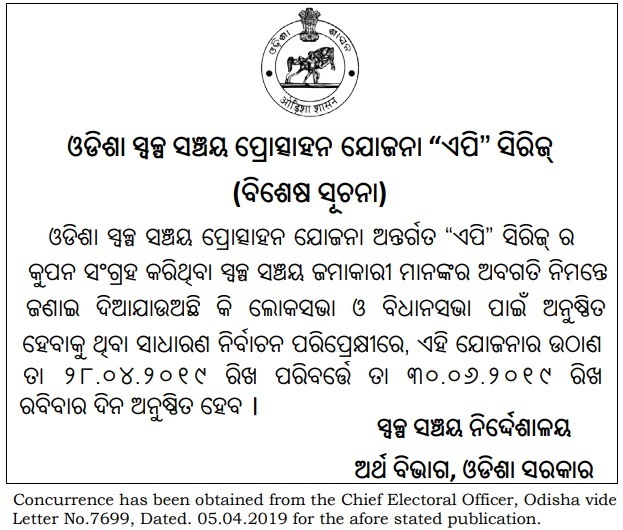 Odisha Small Savings Incentive Scheme "AP" series draw has been rescheduled to be held on 30.06.2019. Launch of Odisha Small Savings Incentive Scheme “AP” Series. Odisha Small Savings Incentive Scheme “AP” series has been launched for the calendar year-2018. Issue of free incentive coupon under the scheme has already been started. 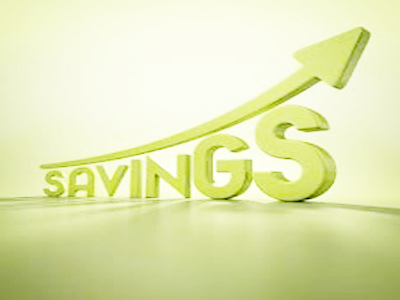 Eligible Small Savings schemes are NSC-VIII issue, KVP, SSA, PPF, SCSS P.O.M.I.S/N.S.M.I.A, P.O.R.D/N.S.R.D.A and 5yr P.O.T.D/5yr N.S.T.D.A. Deposits must made in any Post Offices or Banks situated within the State of Odisha only. SCSS deposits made in Banks should be a Govt. of India Small Savings Scheme. “AP” series web based coupons are available in O/o the Collectors, Sub-Collectors and BDOs. Date of draw-28.04.2019 at Bhubaneswar. There are 2428 nos. of prizes in 07 categories. Starting from Rs. 2,000/- under 7th th category to Rs. 5,00,000/- under 1st category of prize. You may be one among the lucky winners. so Save today and smile tomorrow. Lucky Draw of Odisha Small Savings Incentive Scheme of “AO” series. A lucky draw for award of prizes of “AO” series was held on 29.04.2018 at Jayadev Bhawan at 10.00 A.M. under the supervision of three member committee of judges. Shri Tuhin Kanta Pandey IAS, Additional Chief Secretary finance was present during the occasion. Award of prizes of AN series Odisha Small Savings Incentive Scheme. 1st Prize- Rs.5,00,000/- Shri. Bharat Chandra Sahu of Sambalpur. 2nd Prize Rs.3,00,000/- Sri Satyanarayan Pathak of Bhubaneswar. 3rd Prize- Rs.1,00,000/- Sri. 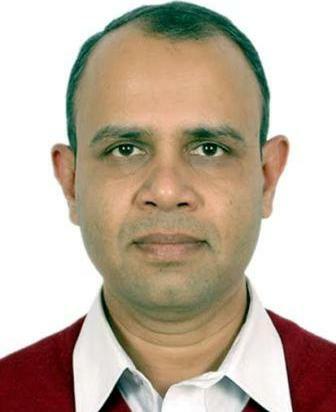 R.K.Padhi of Jatani. 4th Prize- Rs.50,000/- each, Sri. Raju Kampa of Kandhamal and Sri Dilip Panda of Jajpur Road. World Thrift Day was observed on 30.10.2018 throughout the state. To mark the occasion, awareness rallies were organised at all the district headquarters by the District Small Savings organisation. Messages of Hon’ble Governor, Hon’ble Chief Minister and Hon’ble Finance Minister were published in print media. 31st October to 14th November 2018 were observed as savings fortnight, during which debate competitions, symposiums were organised in different parts of the state to create awareness among the masses. © 2015 Finance Department Govt. Of Odisha. Allright reserved, NIC.